July 7, 2018 (Alpine) – Firefighters made progress on the #WestFire overnight, holding the wildfire to 400 acres with containment now 30%. At least 18 homes are reported destroyed and 8 more damaged. Evacuation orders remain in place. A shelter at Los Coches Middle School remains open and pets are welcome at the shelter. If you need help after the #West Fire in Alpine, you can call 211 or click here for a list of resources: https://www.sdcountyrecovery.com/events/july-2018-fire-recovery-resources/. State and county emergency declarations have been issued. "The following is my statement in response to reports yesterday that United States Forest Service (USFS) air tankers were not utilizing the Ramona Air Attack Base, and instead were flying to San Bernardino in between drops on the Border Fire. The same Next Generation Air Tankers used by CAL FIRE were safely refilling at the Ramona Air Attack Base yesterday. “The USFS and federal leaders are failing our region and unnecessarily putting lives and property at risk. The Board of Supervisors last summer called on the USFS and the federal government to land their Next Generation Air Tankers at the Ramona Air Attack Base in order to increase the frequency of drops on a wildfire. CAL FIRE has demonstrated that these types of planes can safely use the Ramona airport. Now we need the USFS to demonstrate that public safety is a higher priority than bureaucratic stubbornness. These planes can carry up to 3,000 gallons of retardant and increasing the frequency of drops gives us a better chance of knocking down dangerous wildfires,” Jacob concluded. 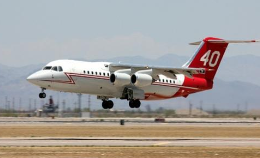 August 13, 2015 (Ramona)--Last week, East County Magazine reported on the United States Forest Service’s announcement that it will not allow its new air tanker firefighting planes to land at the Ramona Air Base. The USFS says the runway is not long enough. However Cal Fire provided a video showing a Cal Fire pilot landing the same type of plane in Ramona. Now, all five of San Diego’s Congressional representatives (Duncan Hunter, Darrell Issa, Scott Peters, Juan Vargas and Susan Davis) have signed a letter sent to Chief Thomas Tidwell of the USFS asking him to take action. Update July 21: Supervisors voted unanimously to ask the Obama administration to take action and allow USFS air tankers to land in Ramona. July 20, 2015 (Ramona)—The U.S. Forest Service is refusing to fly its newest air tankers in and out of Ramona Air Attack Base – and the Board of Supervisors may turn to the White House for help. On Tuesday, July 21 at 9 a.m. Supervisors will consider a proposal from Chairman Bill Horn and Supervisor Dianne Jacob to appeal the decision to the Obama Administration. With the high-risk fall fire season approaching, they say flying the next-gen tankers in and out of Ramona could help save lives and protect property. July 9, 2012 (San Francisco)— A coalition of conservation organizations and a western Colorado county has reached a landmark settlement agreement with federal agencies, including the Bureau of Land Management, U.S. Forest Service and Department of Energy, requiring the agencies to revise a Bush-era plan creating energy corridors in the West. The agreement, filed in federal court in San Francisco, requires the agencies to revise a “West-wide Energy Corridors” plan to facilitate renewable energy, avoid environmentally sensitive areas and prevent webs of pipelines and power lines across the West.